Happy New Year! And, hope all had a wonderful holiday season. Things were busy at The Clicky Post household with family and wrapping up final Dudek Modern Goods orders, but it is good to be back to the desk for more reviews. 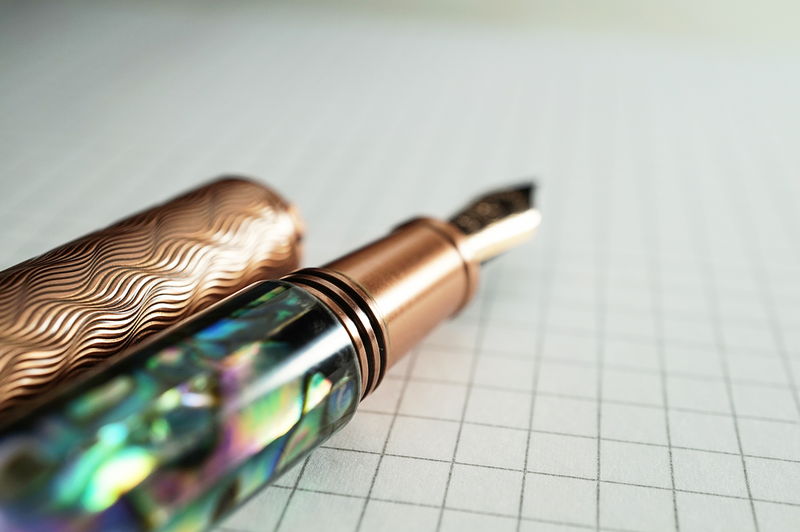 Today's review item is one I've been meaning to review for a little while, the Abalone Shell fountain pen by 3952, an unknown company to me until just a few months ago. This pen was kindly provided by Pen Chalet for review, so special thanks to them. 3952 isn't really a new company, on the contrary they've been around since the mid-90s, but haven't really hit the US shores heavily until recently. They are a Taiwanese manufacturer and their name "3952" is for the highest peak in Taiwan, Mount Jade, which comes in at 3,952 meters tall. 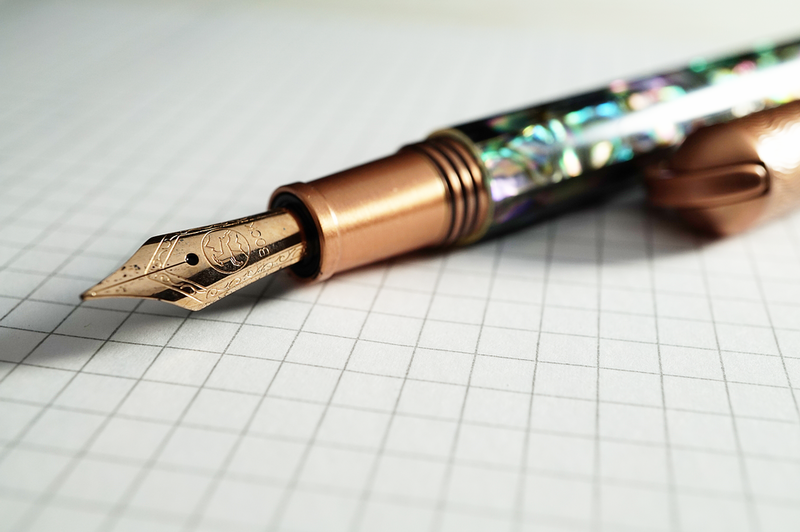 I feel as pen enthusiasts we tend to stick to a few bigger brands, and stepping outside of it seems a bit nerve-racking, so I've been really excited to take a closer look at this one in particular. As mentioned before, the model I'm reviewing is called the Abalone Shell and, as you can probably guess, it receives it's name due to the fact the entire barrel is wrapped in the shiny, iridescent, and unrecognizable material. Upon first seeing it, the pen is quite stunning and makes a strong statement. I would consider the pen to be slender, but not slim being about 1/2 inch in diameter, and completely cylindrical in shape. In addition to the lovely abalone shell, the cap is etched with a very aquatic pattern which could be seen as waves, seaweed... let your imagination run wild, but it blends nicely with the design. Also, the metal has been given a copper plating color which I feel also accents the theme well. The overall quality of the pen feels nice. I would probably put my perceptions of quality and overall feel into the realm of that of a Montegrappa Fortuna or similar. The clip has a unique curved shape and is spring loaded allowing it to flex away from the cap when storing in a pocket or case. On the end of the pen there are threads which allow the cap to be posted, but I find myself not doing so. The pen posted is 7 inches long, with 2.25 inches of that being the cap... a heavy, solid metal cap. So, too much length and too much weight to post comfortably in my opinion. 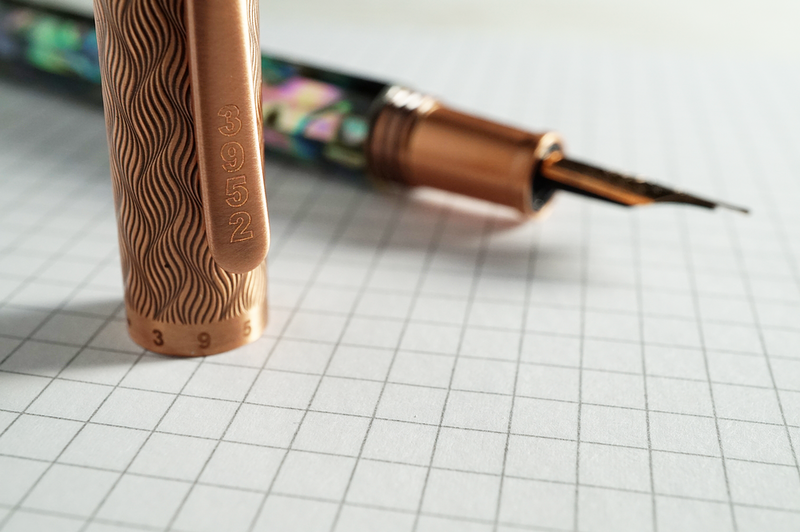 A somewhat refreshing sight to see under the cap was the use of a Bock nib, this one plated in rose gold. Bock is a trusted nib maker used by many brands around the world and I've had great luck with them. This particular nib is "stock" meaning it hasn't been rebranded from the Bock logo and name. Some people are weird about this, feel it shows a lack of "identity" for the brand, but I don't really care or agree with that. For companies to get custom nibs from Bock I've heard it is a considerable investment (like 10s of thousands of dollars in investment...), which is hard to recoup and if it adds cost to the end consumer with no real benefit, why do it? Bock is a trusted name and the nib isn't unattractive. 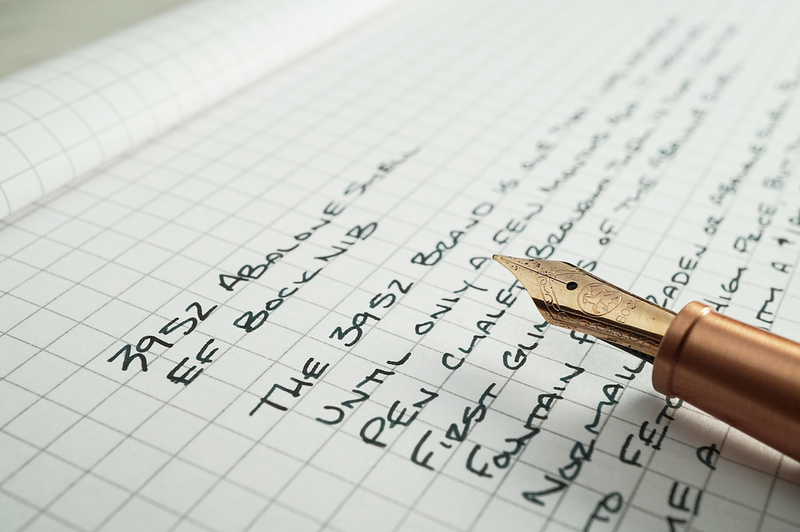 While writing, the Bock nib performs well and stays true to its extra fine (German size) width. I inked the converter (standard international) with Sailor Jentle Miruai, which is a bit of a seaweed color to try a pairing, but I think something more in a turquoise or even purple might be more fun to connect with the shimmer of the shell. I've had no skipping or slow starts whatsoever with the nib, but it does have a good amount of feedback. You certainly feel the tines on the page, but the lines are clean. A little more feedback than I probably prefer, but still a great writer. The section is about your average size (maybe even a little small) but wasn't uncomfortable to use. From a branding standpoint, the 3952 appears in two places on the cap: around the center band (twice) and then laser etched into the clip. Personally, I feel the clip etching is too much and distracts, but the banding is perfect. From a presentation standpoint, the 3952 comes in a standard pen cardboard sleeve and a textured, jewelry style cardboard box. Nice, but not fancy really. The 3952 logos aren't stamped into the box or sleeve, but are attached via a sticker. I think the presentation on the pen could be updated a bit but we're in the market for pens, not pen boxes I suppose. It is actually a really well made case that protects the pen, perhaps just not the most striking experience for the brand. The retail price on the Abalone Shell pen comes in at $185 which is a comfortable price in my opinion. But, that being said, the street price seems to be quite a bit lower. Pen Chalet actually has them right now at around $130 which I find extremely fair. 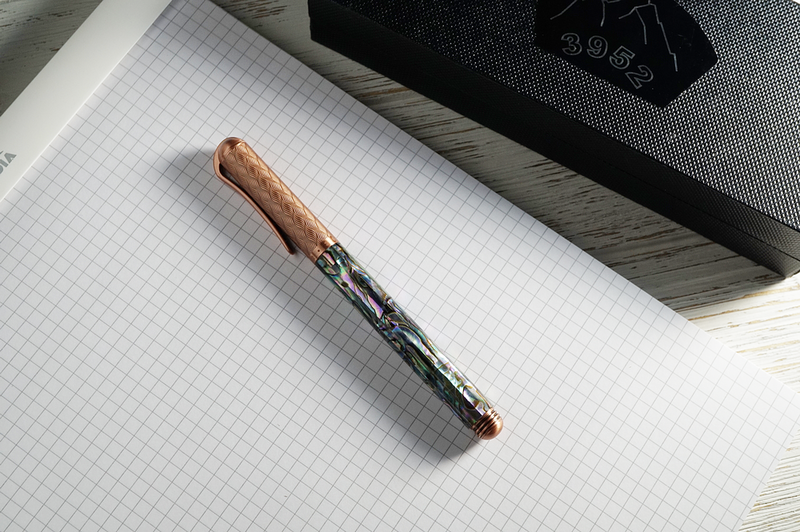 The 3952 Abalone Shell is certainly a looker and if raden or abalone style pens are on your list (but maybe not in the budget...they are usually spendy), this one might tick some of the boxes you're looking for. Special thanks again to Pen Chalet for sending it.